NETWORK FINALS: As we noted on Saturday morning, since all the networks were disrupted by the 9PM presidential address, we’ll look at the Friday ratings more closely today now that we have adjusted finals. ABC: ONCE UPON A TIME (0.4), AGENTS OF SHIELD (0.5) and 20/20 (0.4) were all down 0.1 from last week. CBS: MACGYVER (0.8), HAWAII 5-0 (0.9) and BLUE BLOODS (0.8) were all steady. NBC: TAKEN held at 0.4, and DATELINE was down 0.1 to 0.6. FOX: MASTERCHEF JR dropped 0.1 to 0.7. CW: After 0.2 for a PENN & TELLER rerun, JANE THE VIRGIN stayed at 0.2. CABLE HIGHLIGHTS: It was a huge night for cable news, with 7 of the night’s Top 10 shows, and because the big story was the (relatively) nonnpartisan bombing of Syria, it was led by CNN TONIGHT at 0.65/0.85/2.5M, slightly ahead in the 18-49 demo of Fox News’s THE INGRAHAM ANGLE at 0.54/0.97/4.7M, with MSNBC’s RACHEL MADDOW SHOW behind at 0.36/0.56/3.3M. 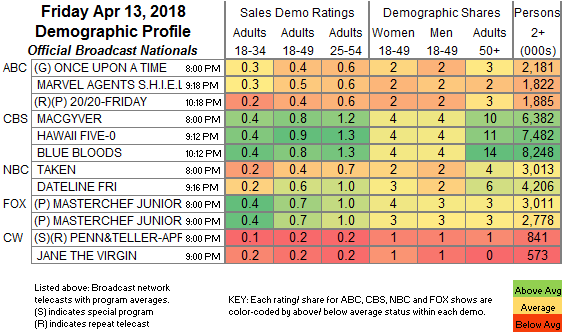 A&E’s LIVE PD was steady at 0.60. On Discovery, GOLD RUSH ticked down to 0.42, and BERING SEA GOLD was up 0.02 to 0.36. Food Network’s DINERS, DRIVE-INS & DIVES rose 0.05 to 0.34. On HBO, REAL TIME WITH BILL MAHER fell 0.09 to 0.29, and WYATT CENAC’S PROBLEM AREAS premiered at 0.08. NBC Sports Net’s NHL PLAYOFFS games were at 0.28/0.26. 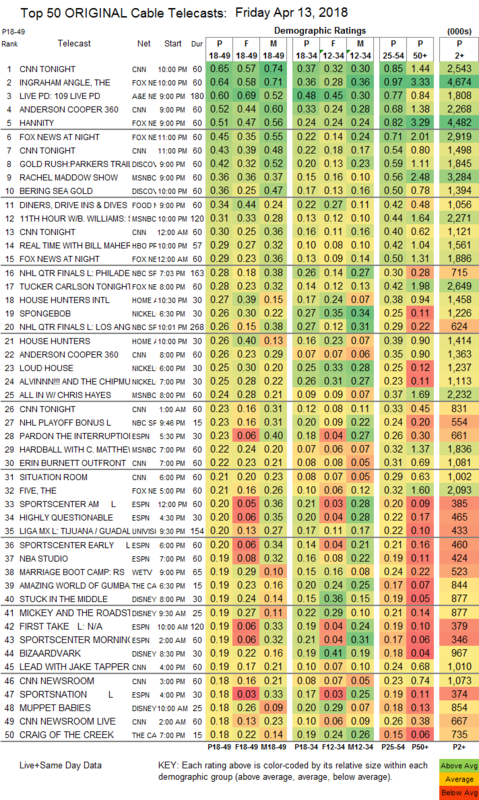 On HGTV, HOUSE HUNTERS INTL remained at 0.27, and HOUSE HUNTERS was down 0.06 to 0.26. Nickelodeon’s SPONGEBOB stayed at 0.26, LOUD HOUSE dropped 0.04 to 0.25, and ALVIN & THE CHIPMUNKS was up 0.02 to 0.25. On We, MARRIAGE BOOT CAMP ticked down to 0.19, and BRIDEZILLAS was steady at 0.12. ID’s EVIL STEPMOTHERS was at 0.18. Paramount’s BELLATOR LIVE fell 0.05 to 0.09, with a 0.07 simulcast on CMT. Cinemax’s RELLIK premiered way off the chart at 0.01/58K.